Welcome to the first, best and most used LPoS service of the entire NIX ecosystem. Profit from the best server environment and a 100% uptime since the start. Not yet a customer? Join now! Fees are only 5%! More than 350.000 NIX staked via this service. Open your NIX QT wallet and browse over to the LPoS tab to prepare yourself for the contract. Fill out the form exactly like shown below. Do not change any of the addresses. That's it! You will now receive staking rewards directly into your wallet without needing to worry about anything. Multiple redundant servers ensure that staking is active at every time! The team is always helping out in Discord. Have a question? Drop it there! 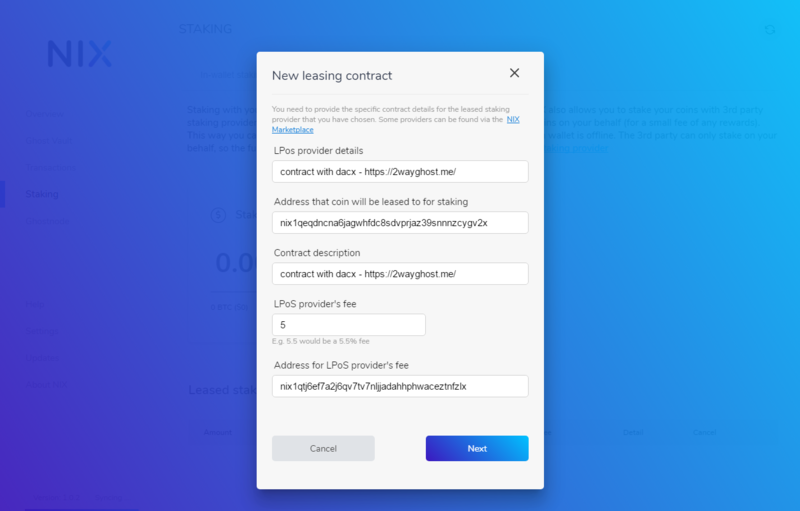 You fully control your coins and can cancel the contract at any time!